So why are slings important ⁉ The body’s core cylinder depends on the slings to facilitate dynamic movement and stability across multiple joints throughout the body ‼Slings help to transfer force through the trunk and facilitate rotational movements. It is the muscular and myofasical components of slings that make powerful baseball/cricket pitches, baseball/golf swings, and lacrosse/hockey shots possible. Even so, MMTs still holds significant value in the scenarios listed above and should be in the repertoire of every practicing clinician. Because muscles NEVER work in isolation, wouldn’t it be important to assess if a PATTERN is weak? Rather than a specific muscle? We sure think so, and that’s why we’ve fallen in love with the anterior and posterior oblique sling MMT shown in the video. It’s particularly useful with athletes who most need the rotational strength and stability required in sports. Try it on your athletes and you’ll be surprised at the HUGE side to side differences you may find. In many sports where one arm or leg is dominant like baseball pitchers, it may be expected that one pattern and sling is “stronger” than the other. However, in other sports while bilateral patterns are necessary and movement coordination/strength should be similar like in tennis, hockey, soccer, you would expect that each side performs similarly when tested. Try it out with your athletes and let us know what you find! Shown in this video clip is a 4 step progression for the POSTERIOR OBLIQUE SLING. The posterior oblique sling consists of the latissimus dorsi muscle, the opposite side gluteus maximus muscle, and the interconnecting thoracolumbar fascia. This sling crosses at the level of the lumbosacral junction and provides what is known as force closure to the sacroiliac (SI) joint. Force closure provides stability to the SI region by allowing it to distribute load between the lower extremities, spine, and upper extremities. This force closure allows for coordinated movement for activities such as walking, climbing stairs, and just about every single sport-specific movement. Take throwing for instance: energy is generated in one body region (the legs), transferred through the hips/pelvis, and released through the upper extremity (hand) to deliver a pitch that can be released at over 100 mph. That’s a lot of power that needs to be generated and transferred effortlessly from one body region to another. That power transfer is where myofascial slings come in. Progression I: Begin in the quadruped position. Perform hip extension using the glute on one side and shoulder extension on the other side using the lat. Progression II: Progress into a half kneeling position. Focus on driving your front heel into the ground to maintain stability. Progression III: Next, work into a lunge position. You can hold the lunge position or work through the range of motion. Make sure to keep your weight forward. Progression IV: Last but not least, incorporate a step up. Really focus on the end position here. Fully squeeze the glutes at the top and come to terminal hip extension while the shoulder is fully extended. The anterior oblique sling consists of the external and internal obliques, the opposite side adductor muscle, and the connecting adductor abdominal fascia. 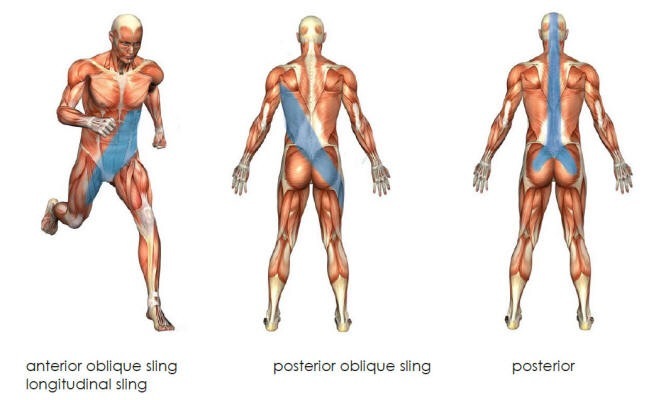 The anterior oblique sling plays a huge role in accelerating and decelerating the body during sport-specific movements including change of direction. While most exercises like planks or crunches can strengthen isolated sections of the anterior oblique sling, it is most beneficial to progress into dynamic training utilizing myofascial slings. Progression I: Begin in supine. Maintain an isometric squeeze of a ball in between your legs. The most important part of the curl up is that the motion and power come from the bottom up. Think of activating the adductor first, then the internal oblique, then the external oblique. Remember: you are curling up from your legs, NOT curling down from your torso. Progression II: Progress to tall-kneeling. The same rules apply as above. Notice the order of movement. Pelvis, torso, arms. Bottom up again. Progression III: Move to half-kneeling. Use a theraband to provide some resistance into hip adduction. Progression IV: Finally, assume a split stance. The same rules apply. Bottom up. Use a theraband for resistance. These exercises should hit your core much differently than traditional core training. Pay attention to your order of recruitment. Remember – bottom up, not top down! This entry was posted in Low Backs and tagged janda, slings, oblique slings, posterior oblique sling, anterior oblique slings, myofascial slings. Bookmark the permalink. ← Does SICK Scapula Equal Pain? “research” is very scare for slings as its more of a theoretical approach. Sorry we can’t direct you anywhere! Look at Vladamir Janda’s work on upper and lower crossed syndromes. Look at Vladamir Janda’s upper and lower crossed syndromes. valuable experience about unexpectеd emotions. It has been explained very simply.very easy to carry out these exercises.Thank you for updating my knowledge. Hi friends! just wanna make sure here. am I extending the overactive lat and overactive hamstring? thanks! Hi Anis, what do you mean? Quick question: So when I find a sling issue, do I prescribe unilateral exercises? After I muscle activate of course. Is there a rx like 1×10 of each progression or 3×10 of 1st then progress next session? Great article. If people are looking for more reading material on slings/meridian lines, read Anatomy Trains. Please look at Anatomy Trains by Thomas Myers for muscle slings or chains. Also look at research papers by Snijders and Vleeming for pelvic girdle muscle slings. If my memory serves me right, they were the first or one of the first to talk about this.